I can finally share with you this little project I worked on a couple of months ago! It's been very exciting to get new clients coming to me and I've loved the whole process of working on new freelance projects. It's also a bit more scary as everything is on your shoulders but then I feel a lot more satisfied when the project is finalised and out there. 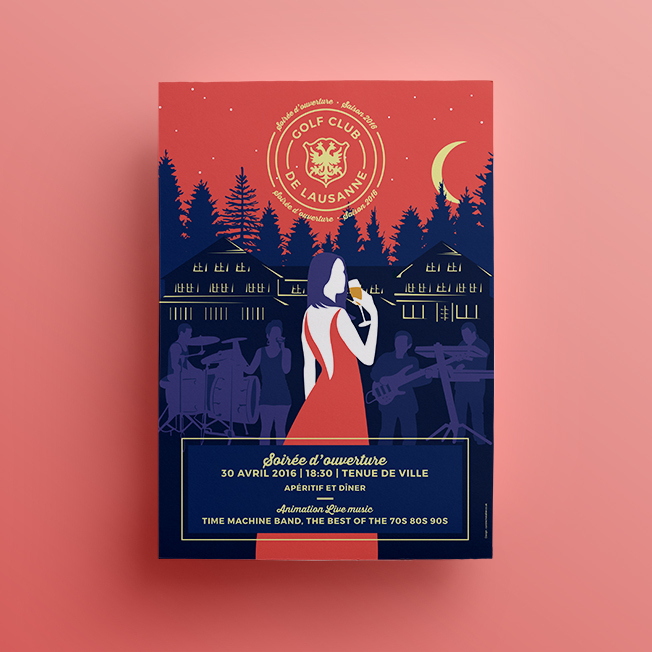 Lausanne's Golf Club, based in Switzerland, approached me to create a new logo and illustrative poster for their opening night after seeing the illustration I did for Visit Llandudno's cover. However, because we wanted to represent a party happening in the evening with a disco band as the main entertainment, it was clear that I needed to steer it in another direction, including a touch of glamour. Et voilà! Ready for a much deserved holiday!